If you watched Jaws or Deep Blue Sea and thought, "I'd love to play a game where I'm the shark," then Maneater is the game for you. It's the new open-world, single-player Action RPG from Blindside Studios, and it was just shown off at the E3 2018 PC Gaming Show. The new 'ShaRkPG' is set in the unforgiving waters of the southern US Gulf Coast, where players will fight to survive in rivers and streams as well as the open ocean, with danger lurking at every depth. 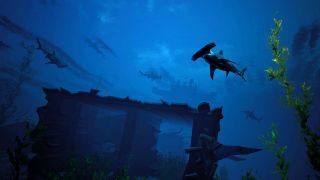 Players will be immersed in a living, breathing world full of threats and rewards, players will have a vast world to explore sunken wrecks, lurk in swamps, or cruise the open ocean looking for their next unsuspecting meal. Tools to make the kill include your wits, your jaws, and your uncanny ability to evolve as they feed. Anything and everything is on the menu ... and it's kill or be killed in these waters.